Bunion Surgery Frequent Questions | Parker Foot and Ankle What causes bunions? How long will I be out of work after Bunion surgery? If you are able to have the Z-bunionectomy, and you have a sedentary job, you should be able to return back to work in about a week. If you are on your feet for most of the day we estimate that you should be able to return to work in about 2 weeks. However, if your bunion is more severe you will need to take somewhere between 6-8 weeks off and you may require a cast for part of this time. The only way to determine exactly how long you will need to be out if to have a complete exam and x-rays done by a qualified podiatrist. 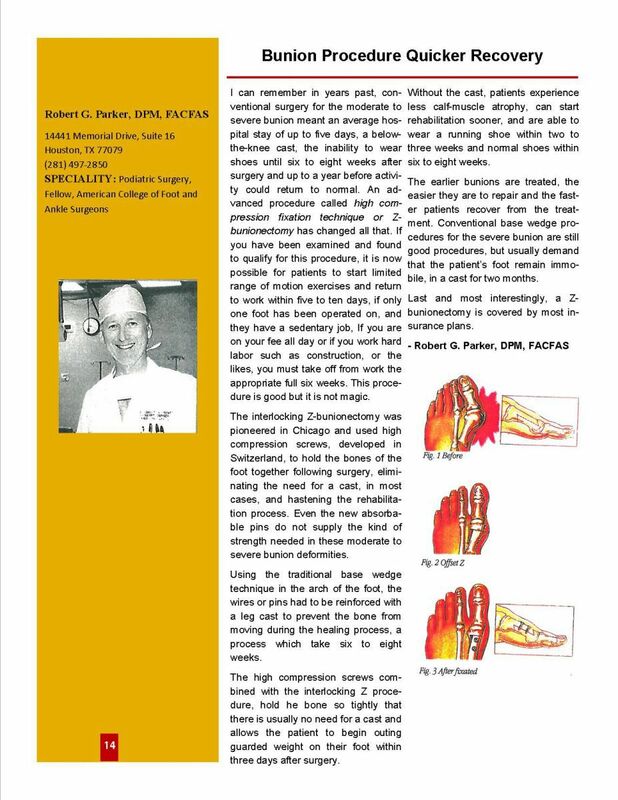 Below is an article where Dr. Parker is featured speaking about the Z-bunionectomy. A surgical procedure often used to correct a Bunion with minimal down time. Dr. Parker was the first podiatrist in Houston to perform the procedure. Your recovery from bunion surgery depends on how severe your condition is and how in-depth your procedure has to be. Complicated treatment involves a longer healing period. A complete recovery generally takes between five and six months, but you can usually return to your activities well before then. You’ll need to avoid weight-bearing on the affected foot for a couple weeks following your procedure. Then you can slowly begin walking while wearing a brace or special boot. After about six weeks, you can usually begin to participate in activities again—if you are careful. You may be able to wear normal shoes as well, though swelling throughout the day may still make this uncomfortable. After several months of progressive healing, you’ll finish your follow-up appointments. Don’t let the recovery from bunion surgery keep you from getting the help you need to relieve your pain. Waiting too long allows the problem to get worse and can increase the healing time. Contact Parker Foot & Ankle in Houston for more information or an appointment by calling (281) 497-2850 or using our website contact form. You do inherit bunions to some degree. You inherit your foot structure, biomechanics, and predisposition for the issue from your parents. 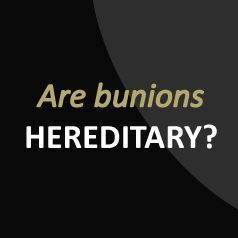 If one or both of your parents had trouble with bunions, you have a high chance of developing one as well. However, while you inherit the disposition for the problem, you are not guaranteed to develop one. You can take steps to decrease your odds that your big toe will displace, as well as slow the progression of any problem. Don’t wait until the bump bothers you to deal with your discomfort. You may be able to avoid the pain altogether by taking care of your feet now. If you notice any changes in your big toe and you’re concerned about bunions, contact Parker Foot & Ankle here in Houston, TX, for more information or an appointment. Call (281) 497-2850 or use our website contact page to reach us. Do I have to have surgery for a Bunion? Surgery is the only way to correct a bunion. This procedure is called a Bunionectomy and there multiple types of this surgery. It is important to know that the sooner we diagnose and treat a bunion the easier it is to correct. Correction of a bunion using the easier Z-bunionectomy enables you to return back to a normal athletic shoe in about 10 days. If the angle of the bunion progresses past a certain point, then a more aggressive type of procedure called a Lapidus Bunionectomy is required which entails a longer recovery time in a fiberglass cast. Bunions seem to form in women more than men, although we do see our fair share of men with this condition. If you are suffering from a bunion, you can probably thank your Mother or Grandmother. Usually, this is passed down from the women in our lives. Often, the type of shoe that is worn also plays a factor into who will get a bunion and who will not. High heeled, narrow, tight fitting shoes seem to contribute to the condition. So, if your Mom has bunions, and you like pointy toe pumps, it is likely that you will be next in line! The typical bunion is additional bone that forms in combination with a misalignment of the big toe. The misalignment forces the big toe to shift (Hallux Valgus). The enlarged joint can become very painful, red, and swollen. Additionally, a small bursa (fluid filled sac) can form causing more pain and discomfort. 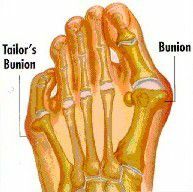 There is another type of bunion which forms on the outside of the foot at the fifth toe. This is called a Tailor's Bunion. It also is a misalignment of the joint and will lead to pain and redness making it difficult to walk and wear shoes comfortably.